To celebrate Roy Freeman's posts on his dad this week, I'm digging up some of the Don Freeman books I haven't reviewed before. In what I have to assume is the sequel to Space Witch (our favorite!) from ten years earlier, we find our hero in a wee bit of holiday trouble. 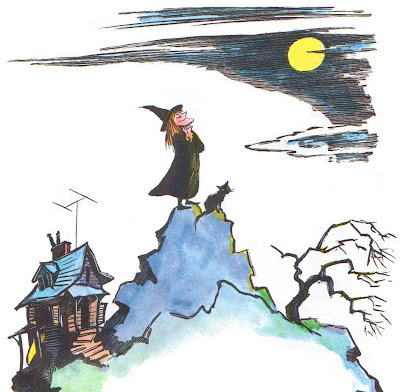 One bright moonlit night, Tilly Ispswitch, Queen of Halloween, stood atop her high mountain peak and sighed, "My, my! What a lovely evening! It makes me feel like being kind to everyone in the world especially children." Doesn't sound very witchy, does she? Thus begins the dilemma. Tilly is in a great mood and she just can't seem to bust out of it. How is she supposed to frighten children of Halloween with a giant smile plastered on her face? So she hops on her surfboard (hep, right?) 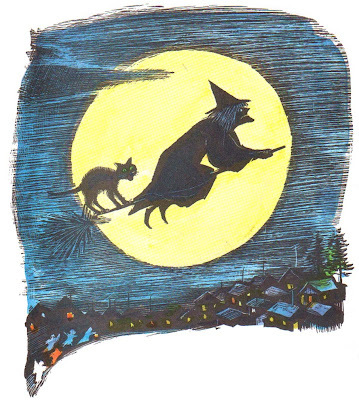 and heads off to see the witch doctor, who in turn sends her to Miss Fitch's Finishing School for Witches. Again, I won't give the story away, but Don Freeman's sense of humor was so delightful and tricky that his books are a downright joy to read. Not to mention fun to look at. I love the expressions Tilly uses to go from glad to mad, and I LOVE the witch doctor's mask. Totally tiki. 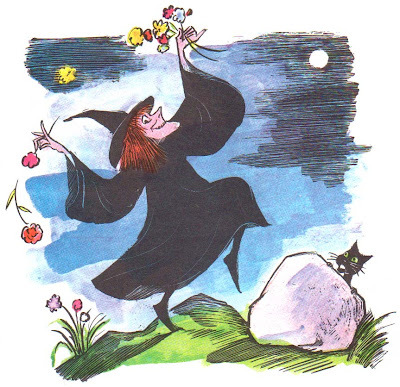 I am so happy that the boy is only afraid of sharks and storms and not witches, because there are so many tasty tales out there that involve wonderful witches. I'd hate for him to miss even one. 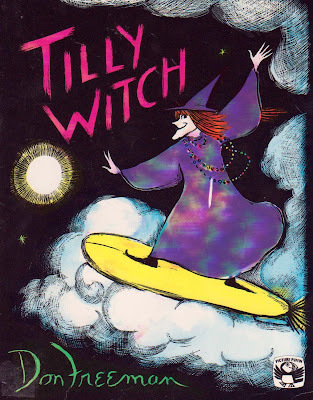 I've yet to find (hardcovers) of either of Don Freeman's Witch books... but they are on my shopping list! Thanks for the review! Freeman was truly talented, and apparently, one of my absolute childhood favorites. Thanks for the feature! Tilly was just newly published in a beautiful new Japanese version. So she is riding again! And this time high... from back to front in the traditional style of Japanese and Chinese books! I have been looking for this book for years! My sister and I love love love Tilly. The picture of her house on the hill is the one that was stuck in my memory!